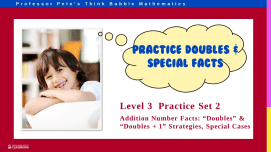 Addition facts for students who are ready to drill for greater speed, or learning extended facts that go beyond the basic facts. Pretest for addition tables. Record speed and accuracy by timing students. Use before teaching addition facts. Posttest for addition tables. Record speed and accuracy by timing students and compare results. Use after teaching addition facts. Strategy of “Count on 1” is reinforced. Includes turnaround facts and missing number questions. Space is included to record student’s time and accuracy. Strategy of “Count on 2” is reinforced. Includes turnaround facts and missing number questions. Space is included to record student’s time and accuracy. Strategy of “Count on 3” is reinforced. Includes turnaround facts and missing number questions. Space is included to record student’s time and accuracy. Strategy of “Rainbow Facts” (pairs to 10) is reinforced. Space is included to record student’s time and accuracy. Strategies for adding 0 and 10 is reinforced. Includes turnaround facts and missing number questions. Space is included to record student’s time and accuracy. 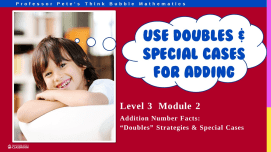 Strategy of doubling numbers is reinforced. Includes missing number questions. Space is included to record student’s time and accuracy. Strategy of “Doubles +1 more” is reinforced. Includes turnaround facts and missing number questions. Space is included to record student’s time and accuracy. Strategy of “+9, Near 10” is reinforced. Includes turnaround facts and missing number questions. Space is included to record student’s time and accuracy. Strategy of “+8, Near 10” is reinforced. Includes turnaround facts and missing number questions. Space is included to record student’s time and accuracy. Remaing facts are introduced and reinforced. All others are revised. Includes turnaround facts and missing number questions. Space is included to record student’s time and accuracy. Set of 5 assessment tests to check on how students are progressing with each of the units in the easy Addition Number Facts series of worksheets. 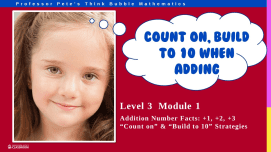 Set of 10 homework sheets to match each of the sets in the Addition Number Facts series. Contains information for parents. Board game with cards to print, cut out and laminate. 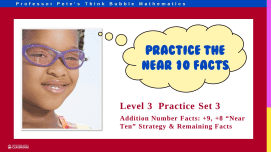 Game helps increase students’ recall speed of addition number facts. 2-4 players. Page reinforces addition facts with a fun colouring-in page.